A RENDERING OF THE INTERIOR OF ELLSWORTH KELLY’S AUSTIN, 2015. COURTESY BLANTON MUSEUM OF ART. 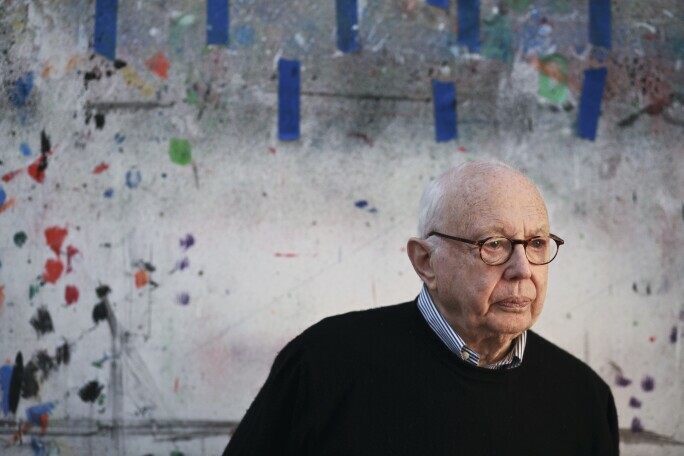 In January 2015, American painter and sculptor Ellsworth Kelly made a remarkable gift to the Jack S Blanton Museum of Art in Austin, Texas: the plans for his only work of architecture. 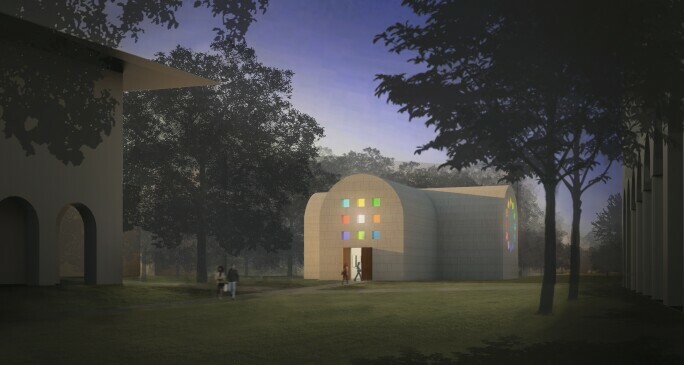 According to Kelly’s design, the white stone structure would be titled Austin, measure a little over 2,700 square feet, and feature geometric coloured-glass windows through which sunlight would tint the interior in various hues. Three years on – and just two years after the artist’s death at age 92 – Kelly’s architectural vision has finally been realised. Sited next to the Blanton Museum on the University of Texas campus, the permanent structure opened to the public on 18 February. ELLSWORTH KELLY IN HIS STUDIO IN SPENCERTOWN, NEW YORK, 2012. © FRED R CONRAD/THE NEW YORK TIMES/REDUX. Like the Rothko Chapel in Houston and Matisse’s Chapelle du Rosaire in Vence, France, Austin is a space for contemplation. And while Kelly’s design included fourteen abstract marble panels that represented the Stations of the Cross, along with a totemic 18-foot redwood sculpture in the apse, he was quick to point out that this was not a work of art about religion. As Kelly saw it, Austin would give visitors an opportunity to commune not with the divine but with light and colour, the two elements the artist revered most. 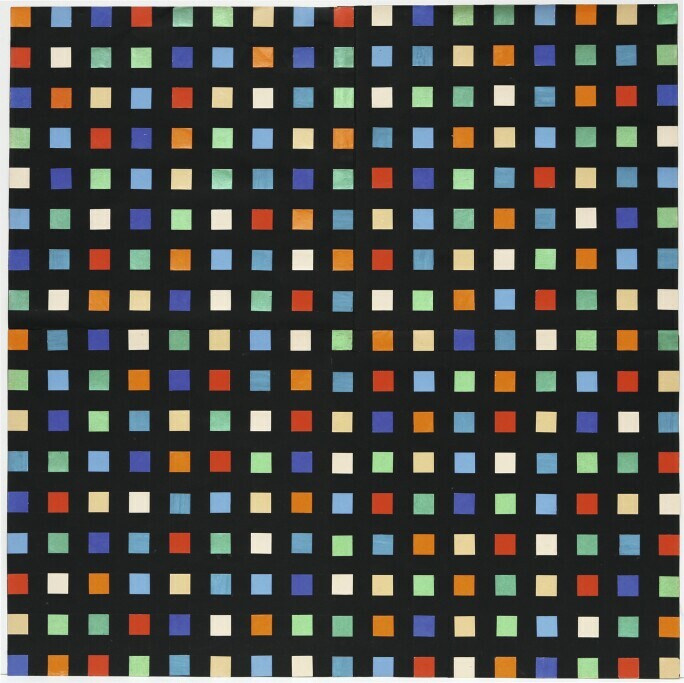 For more than six decades, Kelly’s minimal canvases reveled in the simple yet endless richness of shape, line and colour. His brand of abstraction was meant to elicit what he called “the rapture of seeing.” For him, there was no experience more essential or uplifting to the human condition than the act of looking. © ELLSWORTH KELLY FOUNDATION, PHOTO COURTESY MATTHEW MARKS GALLERY. Unsurprisingly, one of the most profound influences on his work was architecture. After serving in World War II, Kelly moved to Paris in 1948 to study art on the GI Bill. When he wasn’t painting or exploring the city’s monuments, galleries and museums, he was travelling across France to visit its architectural wonders. One that left a profound impression was the Chartres Cathedral. He was particularly moved by the vivid hues of its three large and magnificent rose windows, which inspired Austin’s tinted apertures. A RENDERING OF THE EXTERIOR OF AUSTIN. COURTESY BLANTON MUSEUM OF ART. Kelly designed every detail of the space himself, with the city’s bright sky and sunny climate in mind. “He considered Austin an ideal setting for the project,” says Blanton director Simone Wicha. “We get more than 220 days of sunshine each year, which is vital to experiencing the spectrum of Austin’s windows,” she continues. Along with Veronica Roberts, the museum’s curator of modern and contemporary art, Wicha worked closely with Kelly to ensure that his design would be carried out exactly as he wished. 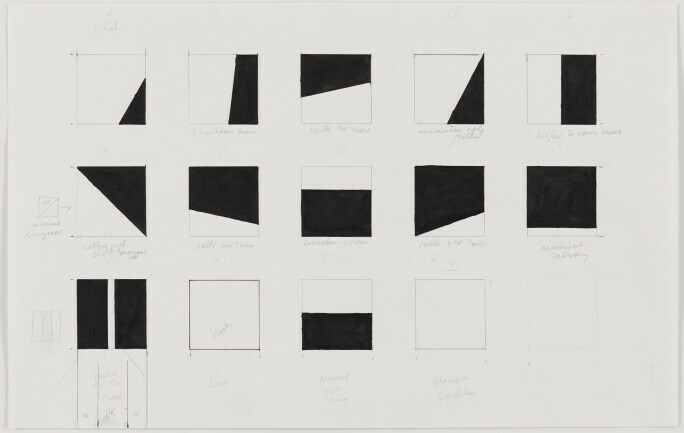 ELLSWORTH KELLY, STUDY FOR STATIONS OF THE CROSS, 1987. © ELLSWORTH KELLY FOUNDATION, PHOTO RON AMSTUTZ COURTESY ELLSWORTH KELLY STUDIO. Jennifer Krasinski is a New York-based critic and writer. Austin, opening 18 February; Form Into Spirit, 18 February–28 April; Blanton Museum of Art, Austin, Texas.